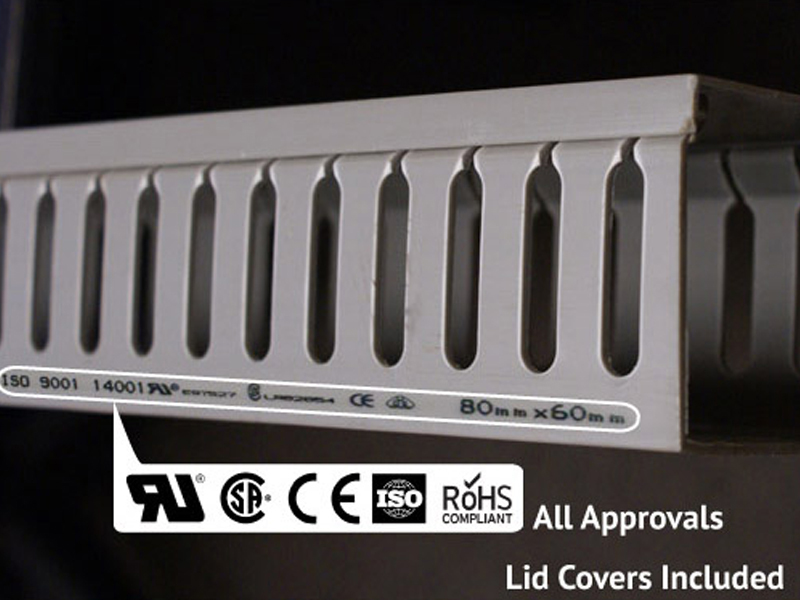 This Open Slot wiring duct is manufactured with wide fingers that provide greater sidewall rigidity, giving additional cable support and allowing terminated wires to be re-routed easily. 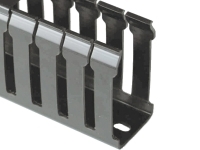 The restricted slot design retains wires in the slot for fast and easy wire installation or removal. 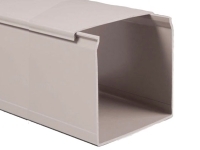 The open slot construction allows cables to be inserted during wiring, and the lid cover can be slid or snapped into place after wiring is complete. When necessary, the slot 'fingers' can be removed to accommodate larger cables. It is made of a lightweight but rigid, heat-resistant PVC (up to 85®C), that is tested and approved for use under UL94V0 and CSA material standards. 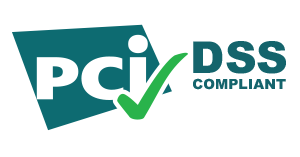 Additionally, it is in compliance with RoHS, the European directive on the Restriction of Hazardous Substances. 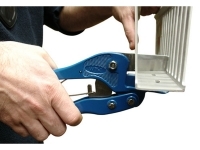 If it is necessary to tighten and secure a wire bundle inside the duct, consider using Cable Ties with our Adhesive Cable Tie Mounts. For neatly grouping wires, inside or outside the duct, our SpiralWrap or our Braided Sleeving may be what you are looking for. 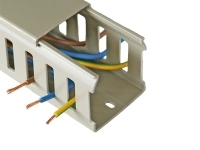 For other wiring duct options, please see our Standard Wiring Duct solutions, which include Open Slot wiring duct, Closed Slot wiring duct, Narrow Slot wiring duct, Solid Wall wiring duct, or our 'Limited Fire Hazard' Noryl wiring duct.